a Happy New Year 2019. 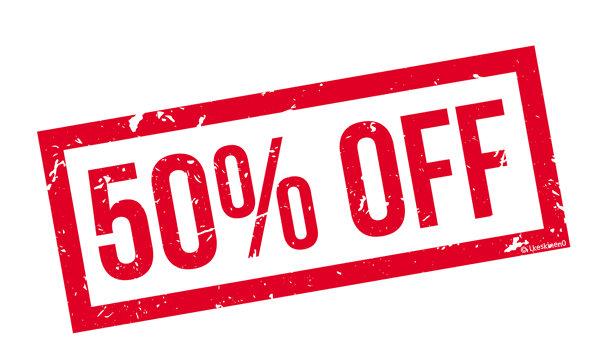 Get 50% off your Initial payment. The Indices are going wild. There is high volatility and we, the AIMSters love volatility. 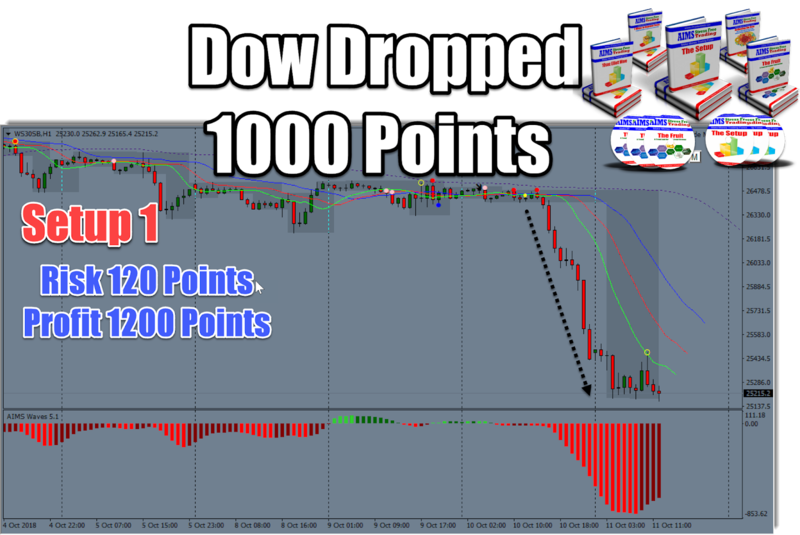 Dow Jones Index is really going wild with 800 points up and down days. 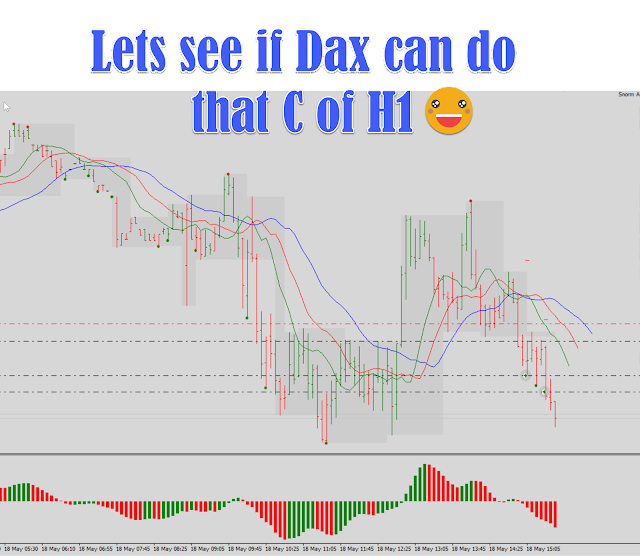 Meanwhile our favourite DAX30 tries to mimic the BIG Dow giving us plenty of setups. Below, is a picture of AIMS The Fruit method. The Market is Generous but are YOU available? 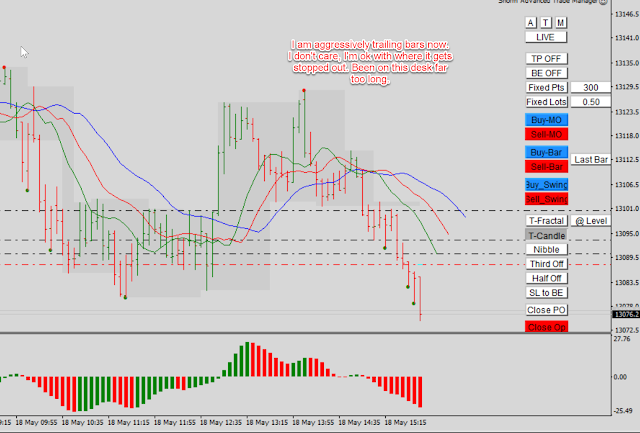 Sam got his share during london open hours, Jozef waited and traded the breakout during trending markets. I got in even later than that and ended up with 2 scalps and then reversal of the uptrend. The traditional way of technical analysis is to look for Supply Demand areas, check support and resistance, find out the key price levels where price seems to react, reverse or hold levels. Compare that to the AIMS Setup method. 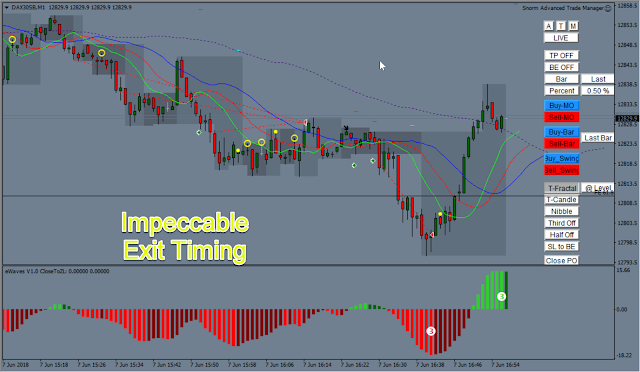 An indicator based, rule based method, you will find that the former requires a considerable amount of time and attention and experience compared to AIMS The Setup. 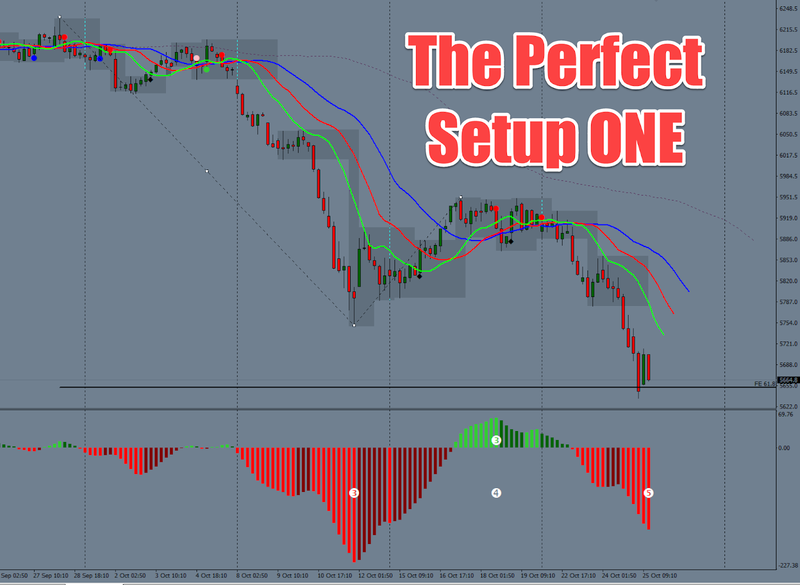 Anyone can learn to trade the setup within a few weeks. It would take good 12-24 months to master, the so called, simple analysis using "naked charts". 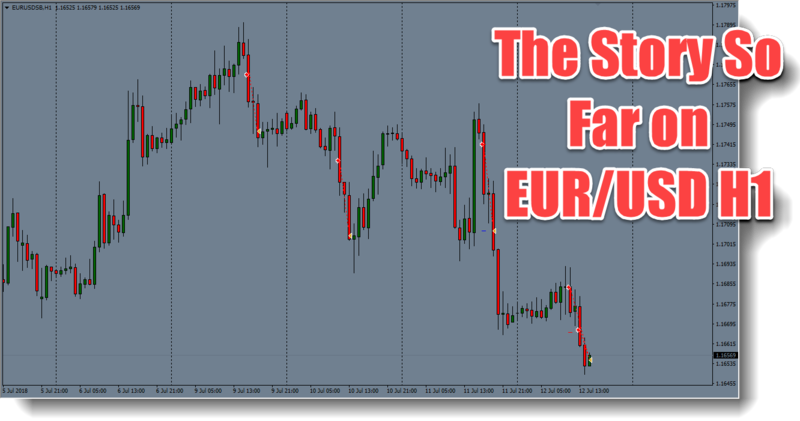 The following series of charts show a trade I just took at the time of writing this. 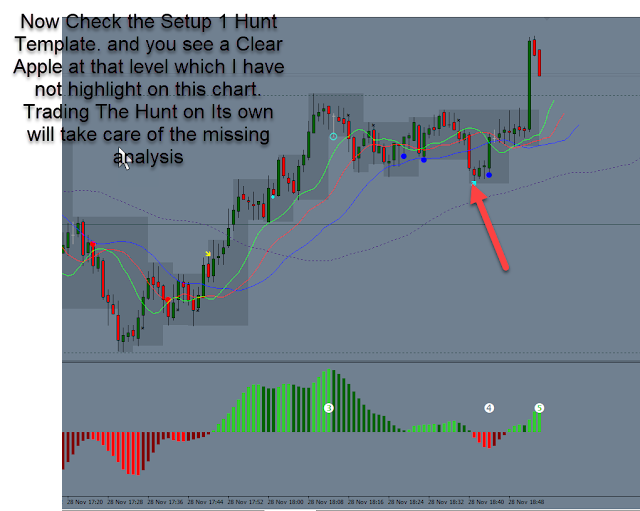 AIMS The Hunt Method created an Apple Signal at that spot without the need for you to learn to trade with S/R and S/D analysis. No price action analysis required. This chart shows what AIMS The Hunt Method looks like. 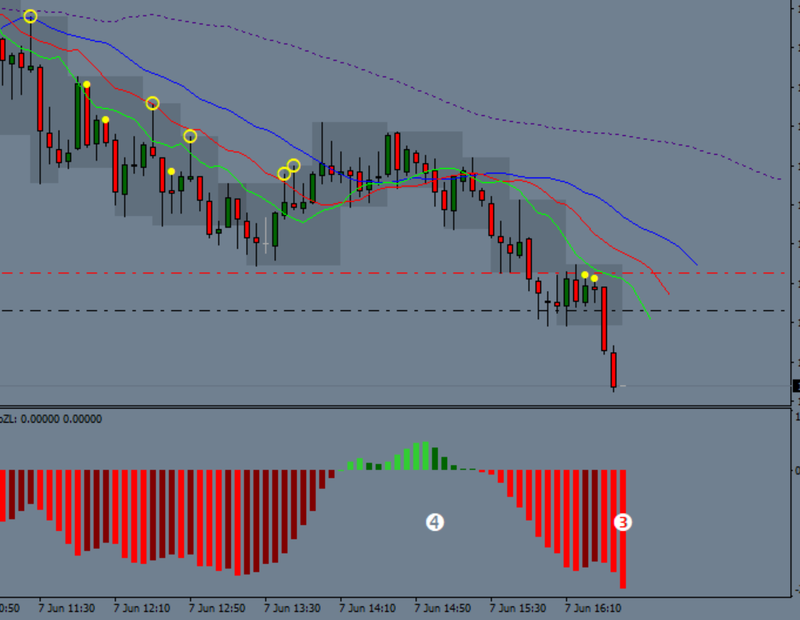 We trade with m5/m1 chart side by side. A unique way of trading the M1/M5 charts. A 1:20 Risk Reward Cherry Signal on the M5 Chart. Well, it depends. Let's have a look at the following pictures of the trades I took on the GBP/USD. 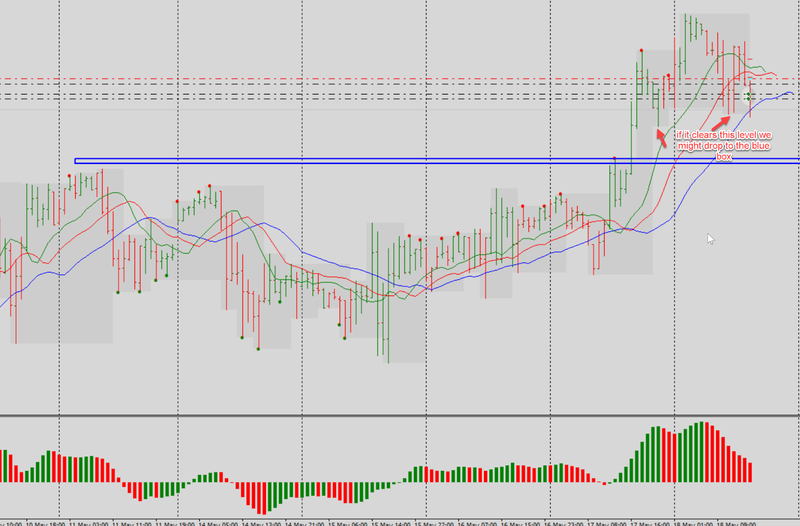 First picture is that of GBP/USD H4 (Four Hourly) Chart. 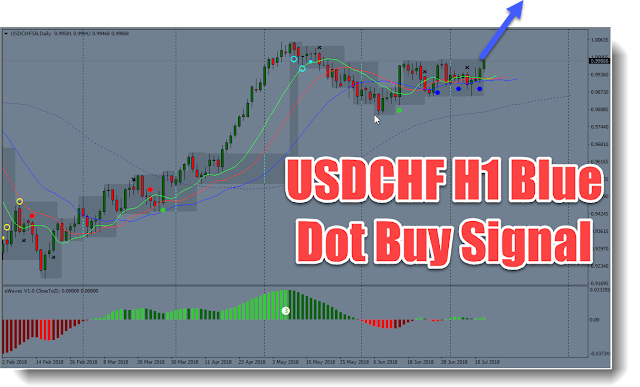 This picture has three beautiful signals and three beautiful trades marked by distinct vertical lines so that you can identify all trades on the next chart that shows the same trades on the H1 (Hourly) chart. This picture convinces me why Setup 1 is an Awesome Setup as well as why Hunt Method is even superior or at least a great alternative. Superior because it requires less time to observe and trade this signal, requires less screen time and can be traded on higher time frames as well as lower time frames. 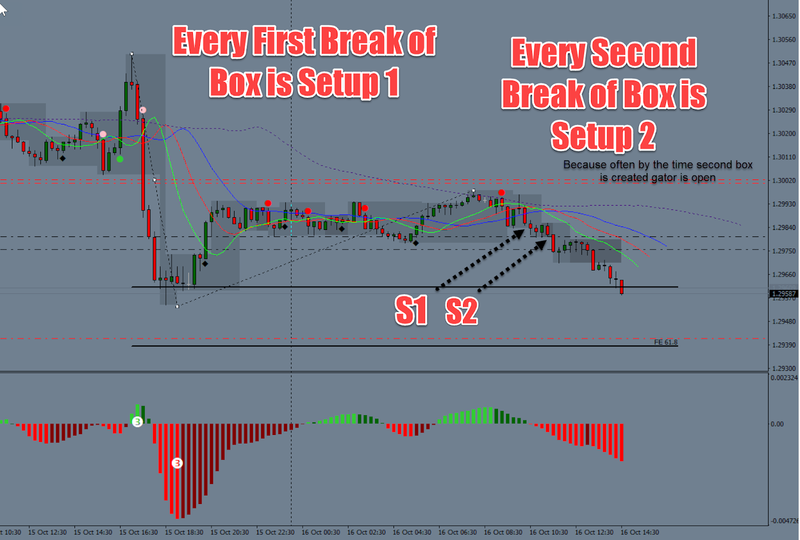 Alternative because people who can't trade the hourly chart can trade the 4 hourly chart and catch the same setup 1's that happen on H1. Same goes for H4/D1. Three Coloured Lines indicate trades that were taken as Setup 1 originally on H1 Chart. But look at this h4 chart, all 3 trades seems to be timed perfectly with Cherry Signals. 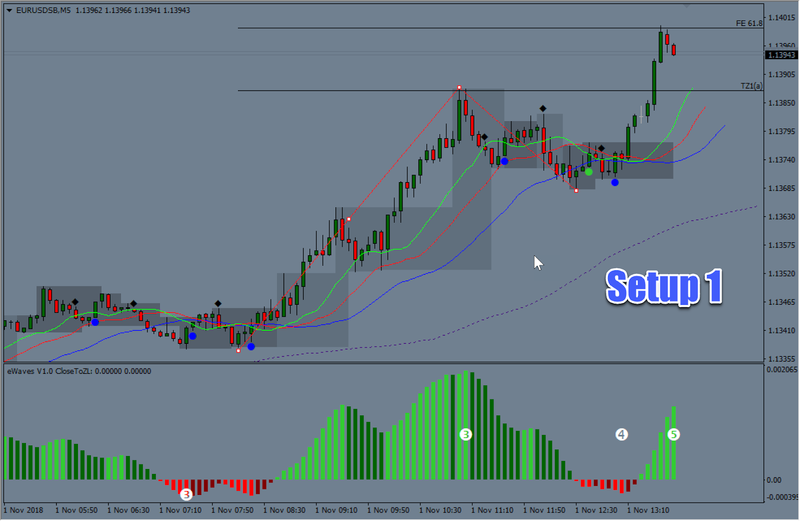 Conclusion: Trading Hunt Method on h4 would ensure you take all the great Setup 1 signals that appear on h1. There are two types of mindsets. One that is the opposite of the mindset required for consistently successful trading while the other the mindset of professional consistently successful traders. When a novice, non professional trader sees a setup, (A Trading Signal) many doubts hits the trader. Instead of looking objectively at the rules of their trading plan (assuming they have one since most don't even bother with this fundamentally important aspect of trading) they look for all the things that have nothing to do with their plan. As a novice struggling trader you start looking for reasons that has nothing to do with your trade plan. In other words the trader loses objectivity. Though confusingly though, for most people, when its a wrong setup, or no setup, trader somehow, finds it very easy to take those trades. There is no hesitation and they jump in without thinking. That is one type of mindset. This mindset is a disaster. The trader may have in their hands, a very good trading methodology but they don't yet possess the mindset that is essential for peak performance. They have not trained for it because they don't yet know it is a "thing". Professional traders know exactly when to enter the market, where to set theri stop loss and take profit levels. They understand risk management but more importantly they are disciplined. Highly disciplined. And the reason they are highly disciplined is because they have acquired the mindset called "Probabilistic Mindset". They know that a single trade can become a winner or loser at any time. They know they cannot dictate the outcome of this one trade. But they also know that their method gives them an edge. So they keep taking signals objectively. You have to do everything in your power to switch to that mindset. There will be a day when you experience the switch. You'll move from finding it easy to take just any trade to finding it hard to take any trades that don't fit your rules, you find it hard unless its your setup, following the rules of your trading plan. that day you will have become a trader with a professional mindset. A trader who's path of least energy has shifted. AIMS Stress Free Trading - The T20 Principle is a training methodology. The FUTURE YOU that you want to be can be achieved at the end of the T20 training course. It is the mindset that you want to switch to. You don't need to change strategy, you need to switch mindset. The Most Important thing I've learnt in life , relating to trading, is that we should risk far less than 1% per trade. Yes, that is what we are told in most of the trading books to risk 1-3%. Even though a very small proportion of the trading books talk about this very important aspect of trading i.e RISK Management in the first place. But what they don’t consider is what happens if you have 10 losing trades in a row? The Biggest Secret of Trading Success is: RISK MANAGEMENT. And risk management has a lot to do with this often-ignored concept called Drawdowns. A good method should always address Risk and draw downs. Some people mistakenly think drawn down begins when your account balance drops below its start point. E.g. if you start with $10,000 and it drops below the 10K is when drawdowns start. I did not know until now that there are so many people who think its that way. Oh no. 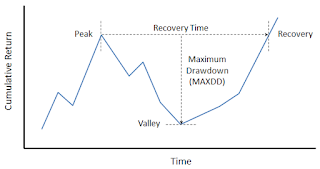 We need to understand that no matter what strategy of trading you apply, drawdowns will occur. Drawdowns are REAL. They happen, they will happen, and nobody can stop them from happening. Because it’s part of the whole game. The game of probabilities. Every now and then you will experience a batch (the T20 Principle) where you get 10 rents or more. Without a solid plan, without knowing about it in advance, it could happen and what most people would do is to abandon the plan. If your plan does not cater for this, your plan will be considered an incomplete or ineffective plan. 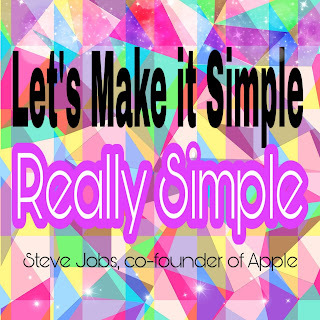 So we must plan but not just plan, we must plan accurately, efficiently and effectively. I learned that there are two factors, which when combined keep those damn 95% of traders below the zero line of their equity graph. When there is no plan, and there are drawdowns, there really is nothing for a trader to think but to RUN as fast as they can. The path of least resistance is to STOP doing what they are doing. In all honesty It's actually a good rational response to stop doing it because it hurts. T20 Principle keeps you grounded. It helps you with staying disciplined. 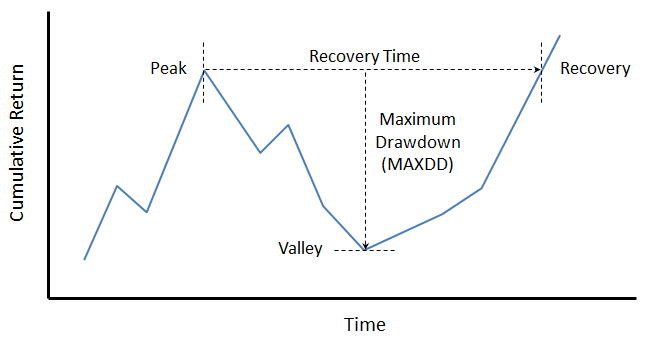 However, what it can't stop is the probability of those major drawdown periods. But it does teach you about it. T20 principle deals with both the discipline of trading and probabilistic mindset. It’s a one shot medicine that cures all the trading diseases there are. This is the main issue. So, what must we do? The answer is simple. If you are uncomfortable with the drawdowns, e.g. risking 1% per trade, 10 consecutive losers could mean nearly 10% drawdown. and if your plan is to NEVER experience a drawdown more than 5% the simple way to achieve this is to use (no , you don't need to change entry method) Risk Manipulation. If 10% draw-down is too big, and it is big simply lower your risk per trade. That is What makes winners consistently winners. And so here comes the example of Fruit method again. 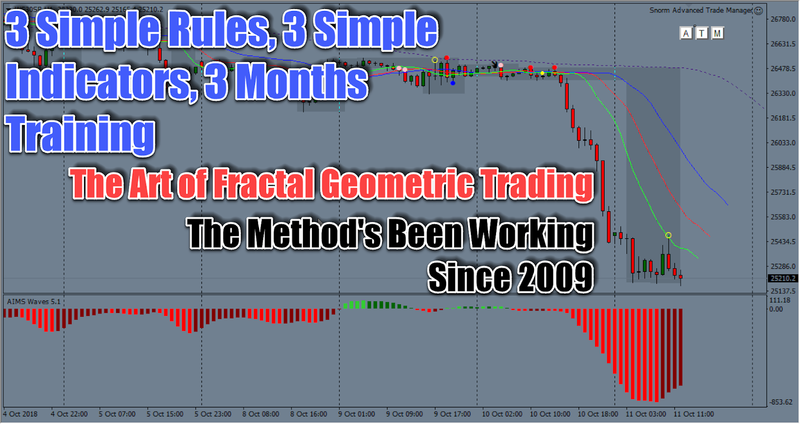 This method trades aggressively, but with very conservative risk management. We enter market only with Quarter risk, adding on the rest of 3 quarters in next 2-3 add-on trades. This way, you can keep drawdowns relatively low, within acceptable margins. If you still experience drawdown of more than 3-5% then perhaps lower the risk per trade to 0.75% or even 0.5% and then scale in to positions. Keep in mind if you score less than 70% on your discipline then the first thing to deal with is to get that figure to above 70%. This can be done with setup 1 as well. In setup 1, what we can do is to make entries just the way we do, but simply take half off at 1:1 and let the rest be trailed with a box. This will reduce our over profitability a tiny bit but massively reduce drawdowns and keep it within acceptable ranges. e.g. if you risk 0.5% per campaign, it would take more than 10 trades to draw-down 5%. and before you know it you will hitting the win streaks again and back in the zone. This setup is much more powerful than even I thought myself. It just never seizes to amaze me. The Setup is a perfectly testable idea. Anyone can look at the rules, test it on past data and do a forward test. To date, Nobody has ever been able to come to me and say, "this did not work". Why? Because "IT WORKS". How do you know that it works? 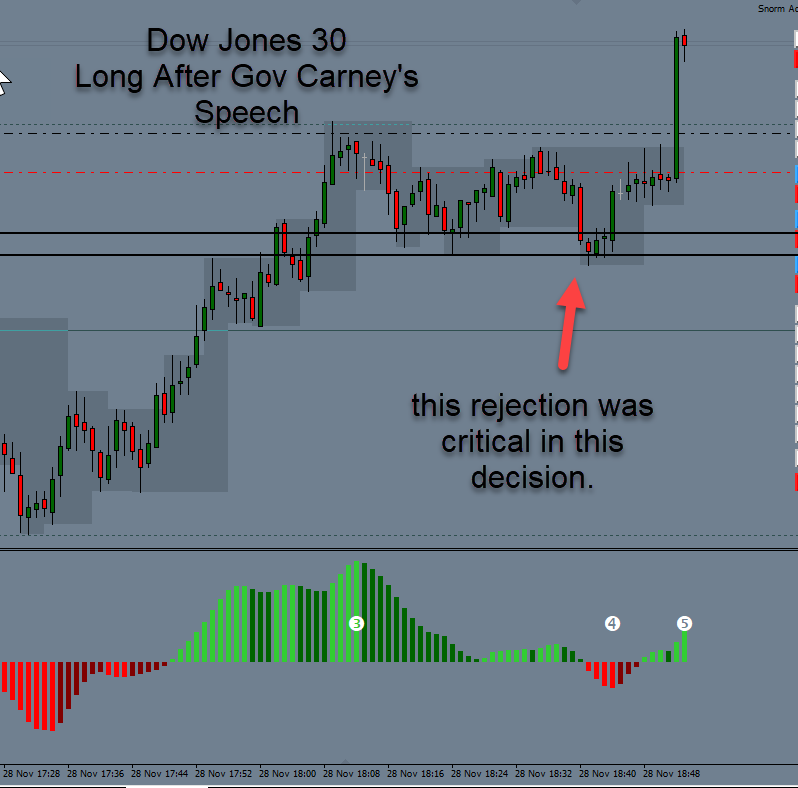 To Find Out, People join our forum, they go through the course material, start trading the simple method, they complete a batch of T20 (The T20 Principle has been our greatest achievement thanks to Mr. Douglas) testing the Setup 1 idea and nearly all of them get the following result. 33% winners 33% Break Even Trades and 33% losing ones.Winners are Twice as big as the losers. You will get 5% on average per T20 (risking only 1% per trade). 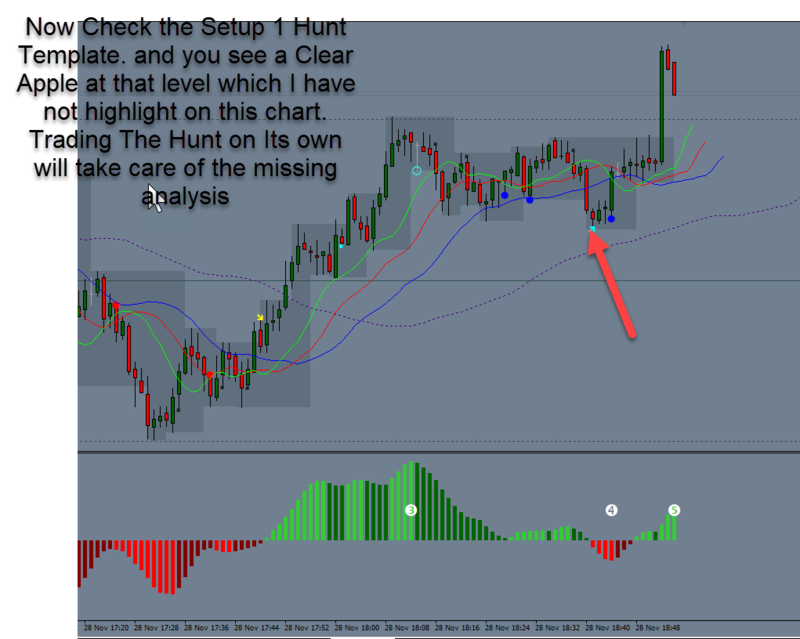 The Setup shows you where to put Stop Loss, Where to Take Profit and Where and When to move Stop Loss to Breakeven. And Hey I've even shared all the pics of the Setup with you already. What we then offer inside the AIMS Forum and Chatroom is help you get disciplined and actually be able to DO IT!!! All the money paid for discipline? oh yes... Discipline is the most expensive and hardest to find commodity when it comes to "BEING SUCCESSFUL". 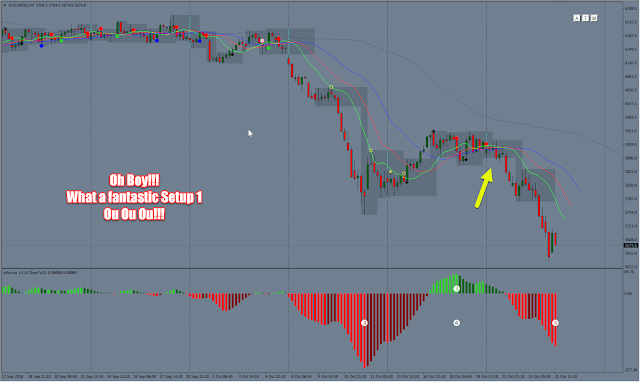 Below is screenshot of trades we took using our Favourite Setup 1 trading the #DAX30 this morning. 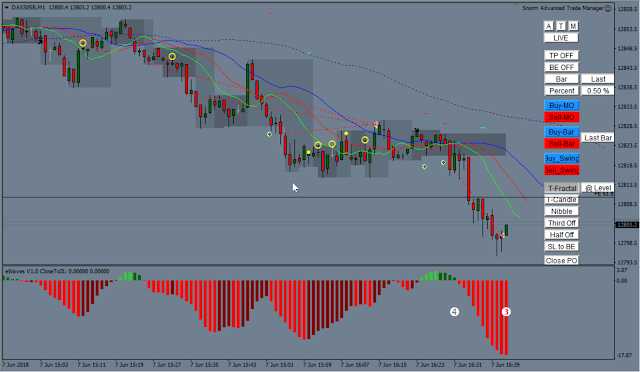 Followed by a Trade Setup on #EUR/USD that we were able to identify on H1 chart. The thing is, it's the same thing, same method, same strategy, working over and over and over again. There is nothing that needs changing. Why? I think you can look at these pictures and be the judge yourselves. It's the "same" thing, similar looking charts compared to the posts made on this blog as early as 2011. 66% Win Rate. Grow your account average 5% per 20 Trades. What is considered a Setup 1 or 2? Here I'm just giving away our core concept. Hey, you can use it too. Yes this is the Perfect Setup. 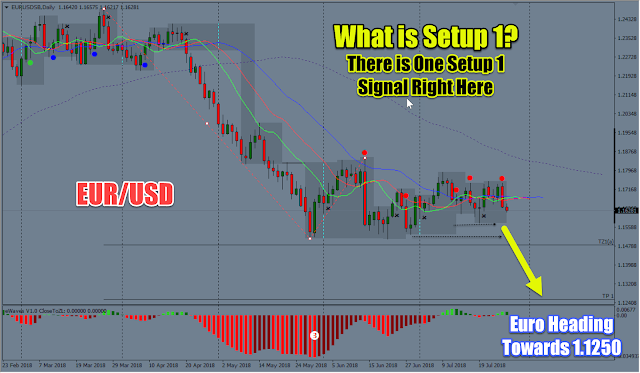 If you'd like to learn how to trade using this setup join us. The Power of Target Zone. 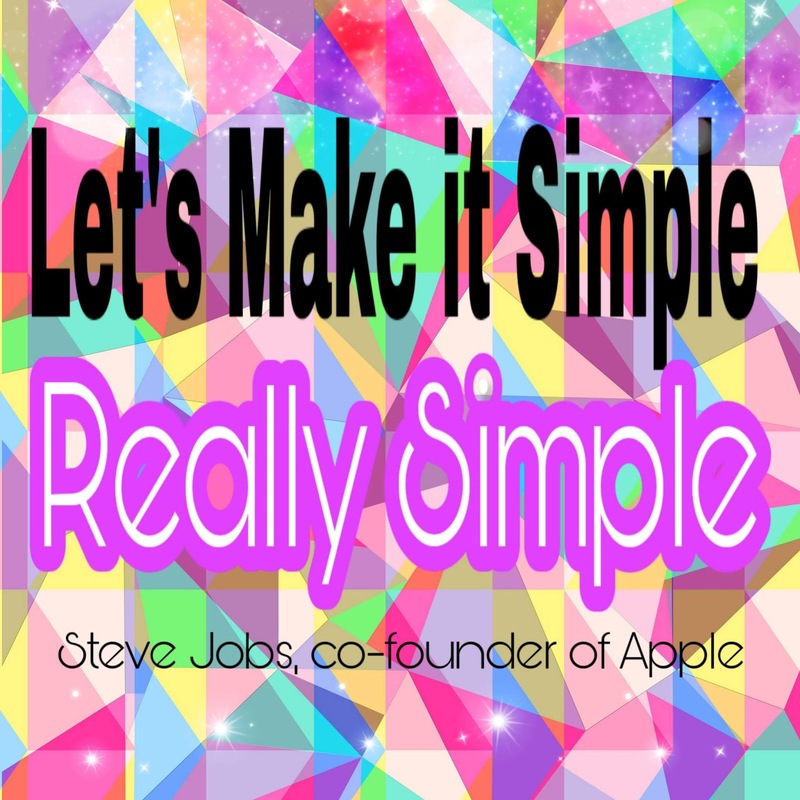 Learn how to increase your success rate by utilizing this simple concept. Have a great Sunday. And let's grow our accounts before we close this year mid december for Winter Holidays. Trading does not require hard work. Just Patience and Discipline. 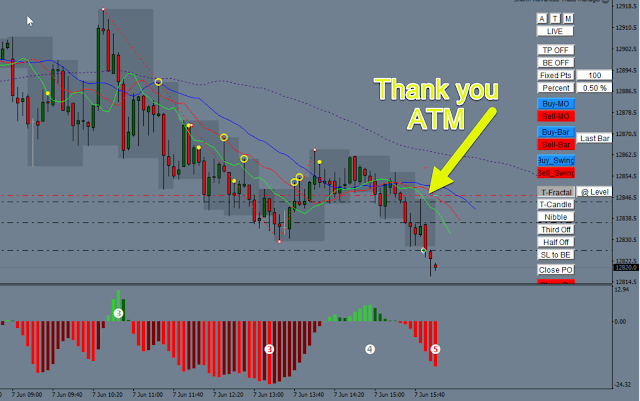 Would you like to know how AIMS Stress Free Trading - The Setup performed on Indices Yesterday? Well, the stock markets crashed and made news all over. Before that crash, we had a slight murmur in our trading room. "All Indices are showing Setup 1 on the Hourly Time Frame"
The most important part of trading success is "to have solid rules and following them religiously". No matter how robust and efficient the method, if you don't follow the rules you will Destroy your account .WHY? Are a mechanism to protect ourselves from our Flintstones brain. 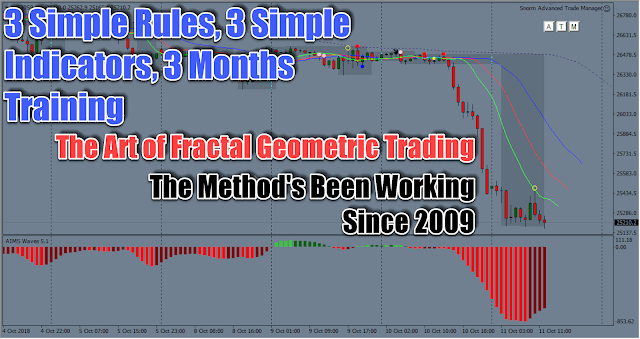 The primitive flight and fight response mechanism can be countered only by accepting to trade only by the RULES. In the heat of the moment when your vision is blurry the RULES will work as Light Houses, beacons and torches to get you out of the darkest dungeon and light up the path that may eventually lead you into the broad daylight of consistent success. A system is a effective only if you use it! A simple Checklist will ensure you remain Discipline 100% of the time. Trading or Any other Success in life is at least 80% a Psychological thing. Its Mental. 20% Mechanics. Below, I copy something I wrote in the Slack room. Thought' I'll preserve it here. 1. Trader should know how to differentiate between a Trending Market and a Sideways Ranged / Boxed Market... on The Time Frame they are Looking at. 3. Keeping above in mind , one should trade both situations differently. e.g. Setup 1 takes this information into account. 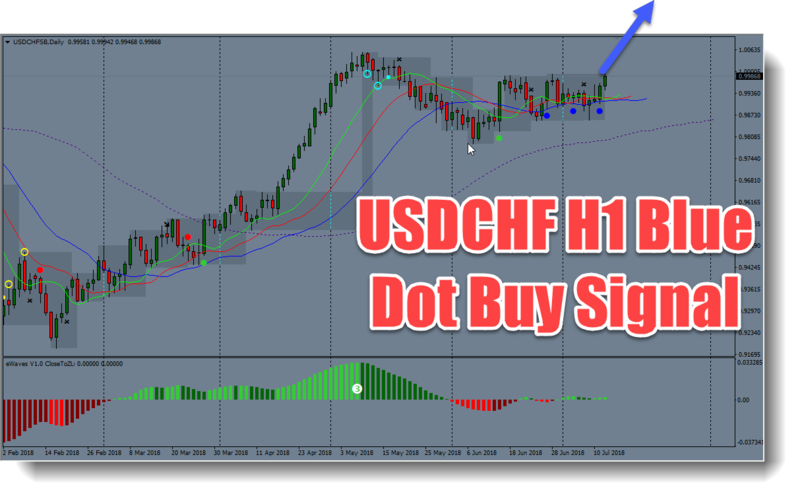 A setup one tries to signal you, that the 5xHTF is trending while current time frame is sideway. 4. 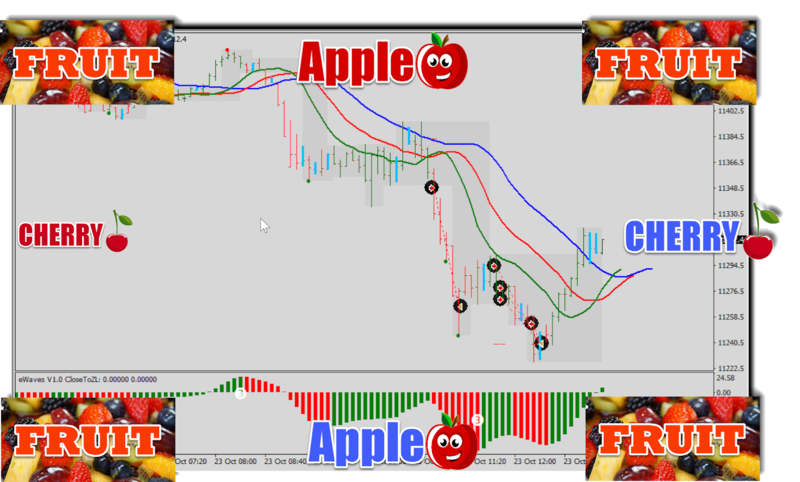 Now when you trade Fruit method, that information does not simply vanish and dies. it's still valid. but you should be able to know what you were doing and translate it into fruit method. You should know this concept and apply it without indicators (purple) indicating it to you. if you don't yet know the above concept then try 5 batches of T20 using Setup 1/2 only. hope this helps and I made my point. "Hey guys, Invest in Index Funds and Go to the Bahamas"
Our Method achieved 202 Winners since the Start of this year. That's just 7 Months of trading. In the following sections, we list some rules that can help investors improve their investment decisions. These guidelines come from our experience and are not necessarily based on new theories. the wrong products, or your positions are too big. 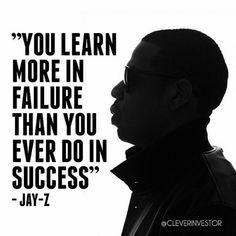 The biggest losses happen after investors make their first big profits. you can pride yourself on its success. investors work with the wrong trading concept. with an investment concept is to get the best average performance. the profit target when opening a position. the long run, it ruins every account. also a big loss in the account, although it may not seem as damaging. execute it systematically as part of a long-term strategy. sentiment, mainly because a product seems to have changed. Each investment strategy has its advantages and disadvantages. knowledge, the profit potential disappears. stocks, bonds, stock index futures, or commodities. investors have neither of these advantages. real-time trading results confirm that the trading concept works. information. Speculating with this “old” information is dangerous. willing to share how the trading concept works. reliable investment strategy and to guard against being greedy. no matter what the markets are doing. results, reevaluate the trading concept. in any given market situation. and be willing to trade it even after a string of losses. The Swissy had a good strong wave 3 up during parts of March and April this year. It then completed its pullback of Wave 4 back into the purple during may nad parts of June and stayed in a tight sideways AIMS Box within june and this month of July 20018. Now we have a 3rd Blue Dot signal. All the rules of Setup 1 Long apply. Buy above the box. 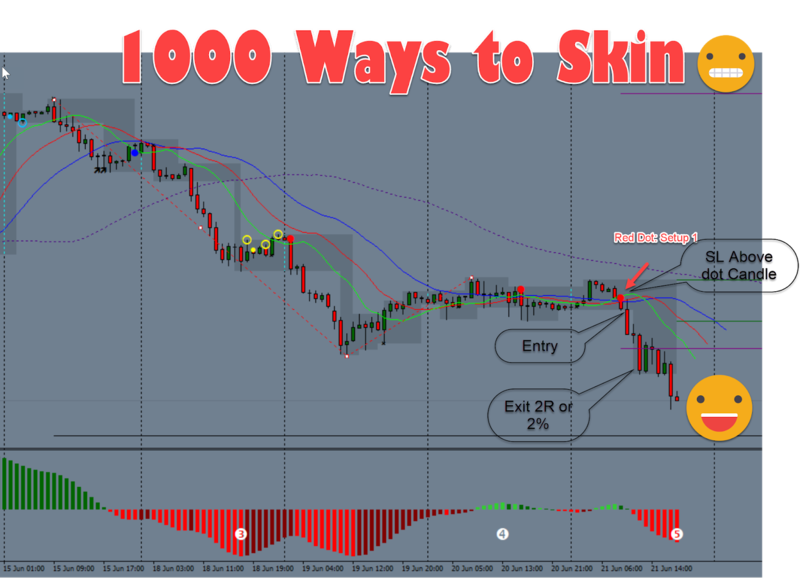 Labels: 10sec Elliott Wave, AIMS The Setup, Higher Probability Setups, How to Trade Correctly, How to Use Elliott Wave? 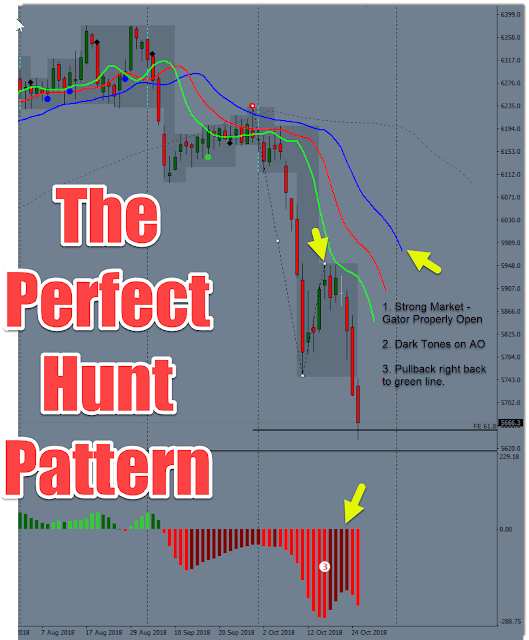 The Way to make profit is to find a pattern that gives you statistical edge, its easy to find, and its tradeable. 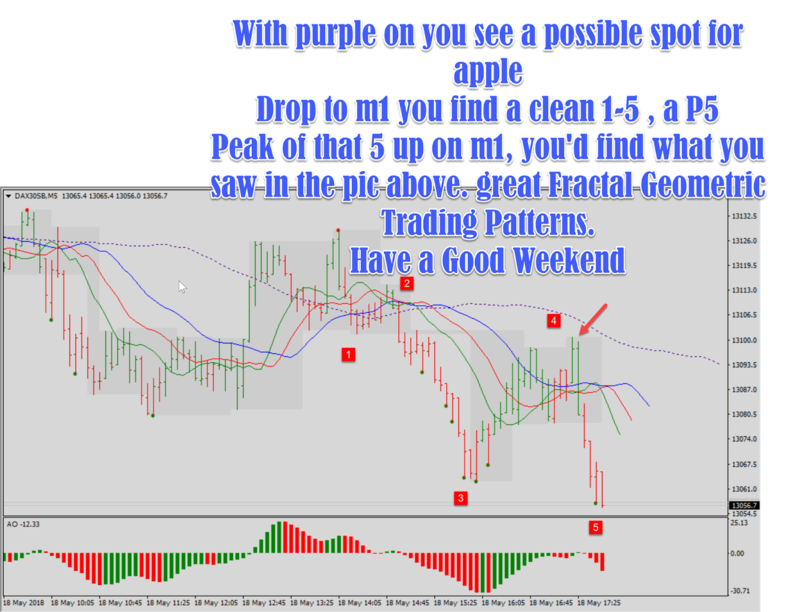 The pattern of Find a wave 3 and 4, to catch wave 5, i.e. 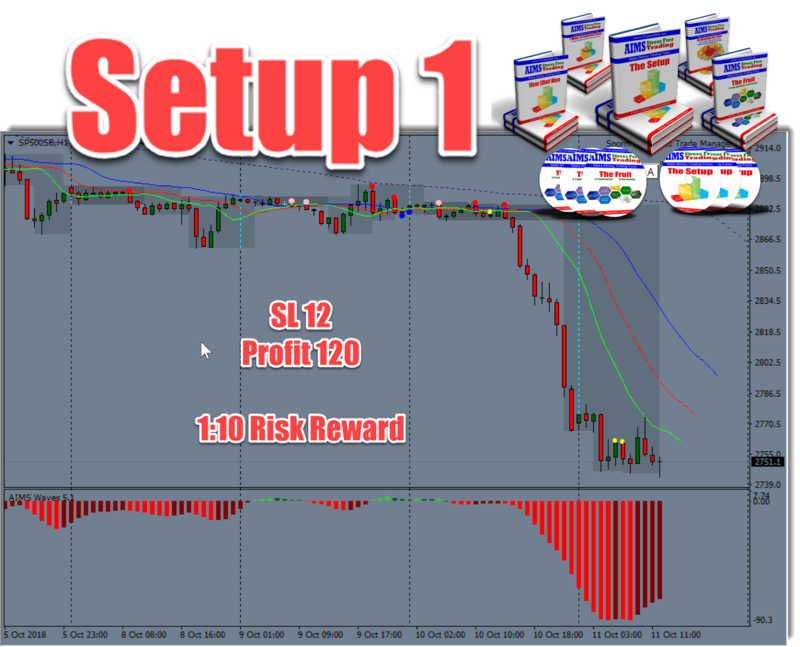 Setup 1 is one that gives you Higher ODDS of success. Now you have options to apply risk and trade management techniques to manipulate results. e.g. 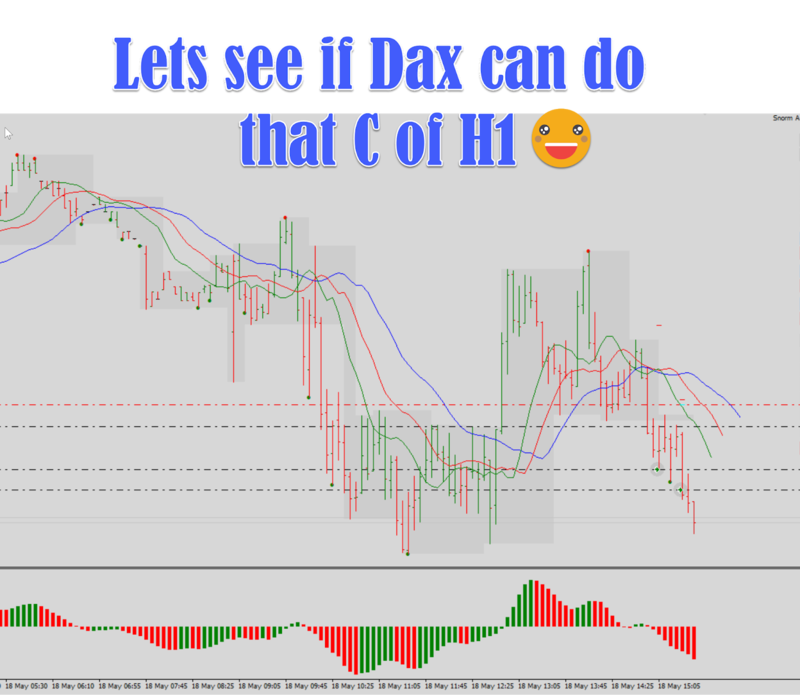 in this example of Setup 1 on DAX h1. 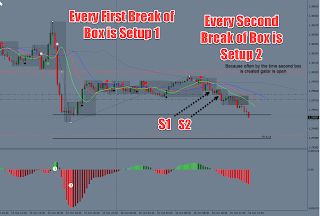 You could have taken Entry using the Standard Box entry with SL above the box and Entry Below The Box. You will then double that distance between SL and Entry and that would be your 2X (or 2R) Target Point or Take Profit Point. But also, you could have done this. Took entry below the box, Had 50 SL, that was somewhere between the box. and set a 100 points SL. 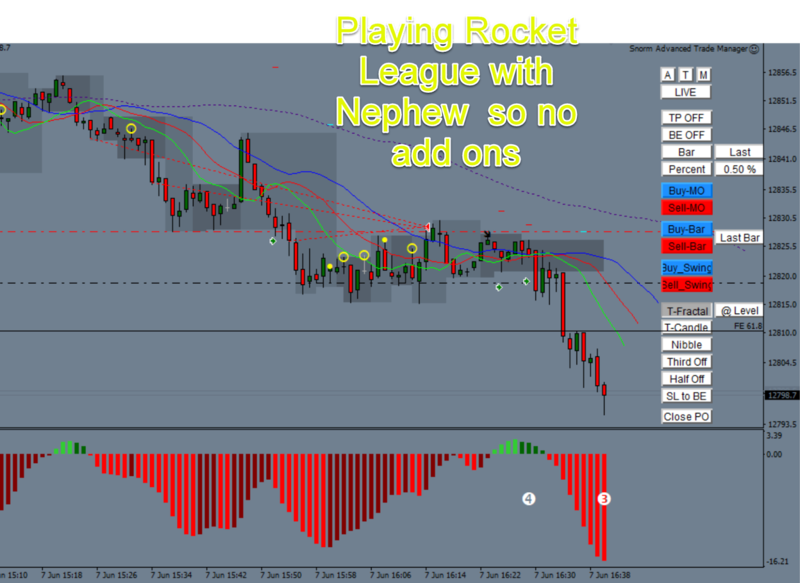 That meant I got 2R profit, and it was hit , in time and points, far before the example above. The Setup that gives us the edge in the market is what we call the Setup 1. And here it is. Below I give examples of two types of setup 1. If you are an AIMS Member you'll benefit more from the following images as you'll know the background and further explanation about it. I have copied a few of my posts from our Live Trading Group. It focuses on MTF (Multiple Time Frame) Setup 1 and Most potent trend-following signal with a counter wave entry method The apple Setup but MTF Apple. The Apple occurs at the peak of Wave 4 but its a leading indicator that takes you into the next wave 5. Its counter wave since its counter to the direction of the current wave but its in line with trend since the trade signal is in the direction of the previous wave 3. Cherry/Apple and S1/Seed are MTF sister setups. A Wave three is the most obvious strongest wave on your chart that consists of max 140 min 100 bars. everything about the future is a potential and everything in the now is connected to the immediate past. So a wave 3 in the present is only a three provisionally and will be confirmed a 3 when we have the 4 in future. a wave 4 is not a random market. It's not just any sideways market contrary to our previous thoughts on it few years ago. Wave 4 is a wave that is well inside the Structure. The market has periods of noise and periods of order. Wave 4's happen within order. (although if you go down a time frame or two within a current wave on the current time frame, you'll see "disorder". that is why we used to say, when you see noise, and no order, its probably a wave 4, but on a higher time frame. So when you see a wave 4 on current time frame everything on the lower time frame of that time frame will be under the umbrella of this wave 4. Note: upto a certain extent. E.g. a wave 4 on D1 chart will still produce beautiful wave patterns on the m5 or m15 chart as long as there is enough volatility for the market you're looking at. When is a Wave 4 not a Wave 4? if a wave 4 does not pullback at least 38% or if it pulls back rather impulsively and goes beyond 50% of the length of wave 3, its not a wave 4. Meaning its not a wave 4 that we consider for trading the Setup 1. 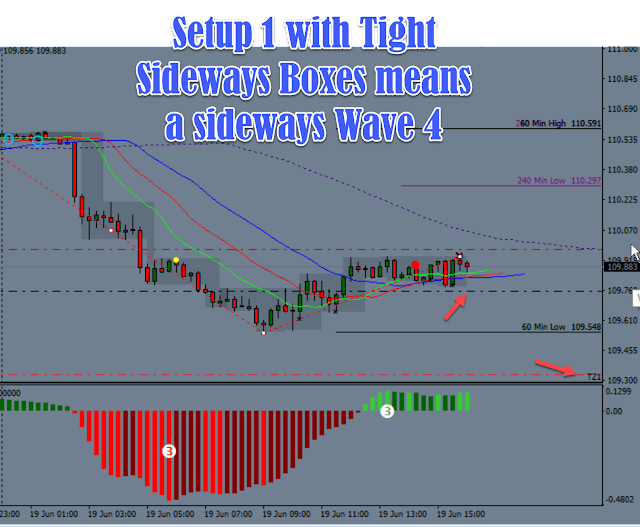 A setup 1 wave 4 is FLAT. If you can give your charts 1 min 8 times a day Trade the Forex, Gold and Oil with us. Below We traded Today The Hunt Method on DAX M5/M1. The start of the day was a bit slow but later it picked up. I will show you how we traded it in pictures. Become a member to learn how to trade AIMS The HUNT method. A setup 1 on M1 which was a great Fractal Geometric Hunt Setup on the M5 Time Frame. I thought this market was about to turn around so used the Fruit Reversal Candle to Time this Exit. 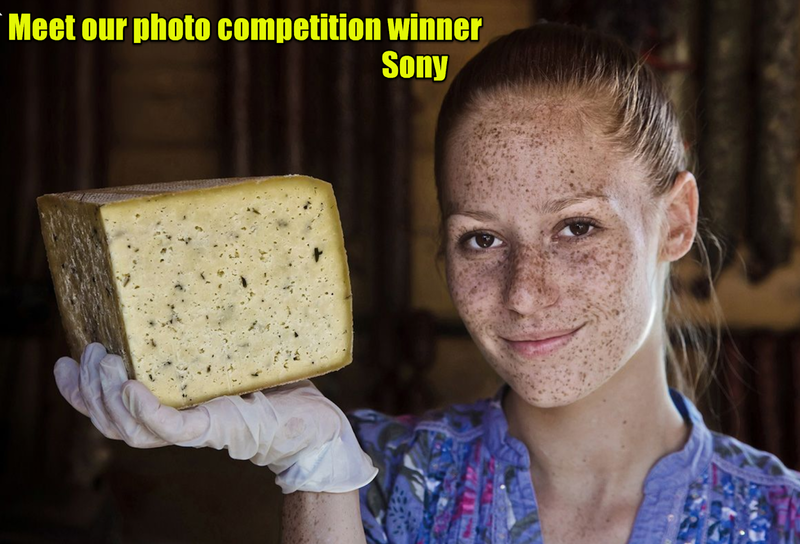 Next picture shows it was great timing. 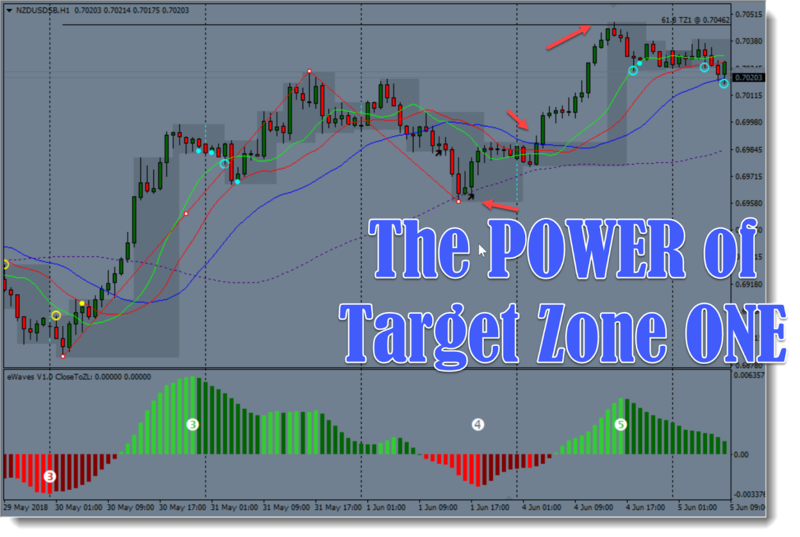 The Concept of Target Zone ONE is very powerful. It gives you 80% success rate. 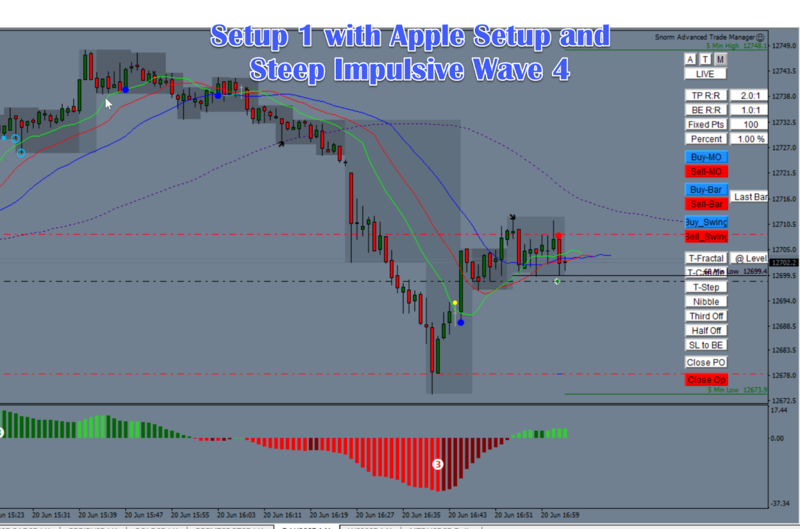 If you can figure out The Setup 1 or The Apple Setup you have a great chance of success. One can make a good 6 figure income a year trading nothing but "Working Towards TZ1"
The market was not as volatile as we like but looking at the hourly time frame we saw that the wave might want to pull back a big. 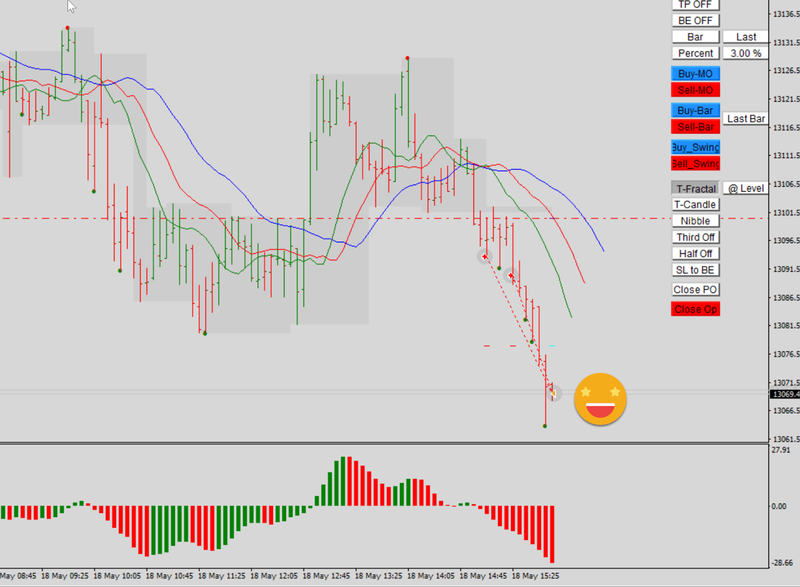 ABC was visible with a possibility of C down turning into a possible nice 1-5 wave formation on the m5 chart. So we caught the possible 3 down within the possible C down. 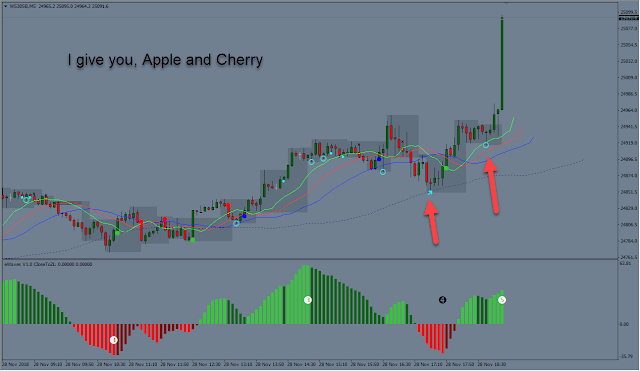 There was an apple signal at the peak of Wave 2 but it was not clear to me. So I waited for box breakout. As shown in the picture when you click on the t-candle button ATM automatically trails the last candle high/low. 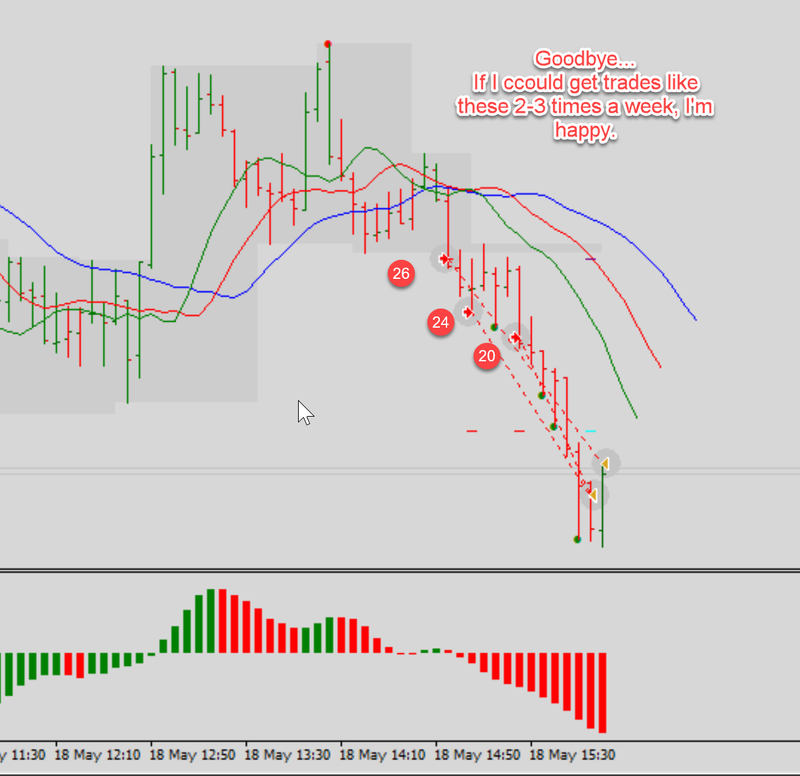 I saw that it broke the lows and it was giving me good profits. I noticed that it might be time for it to pull back a bit. 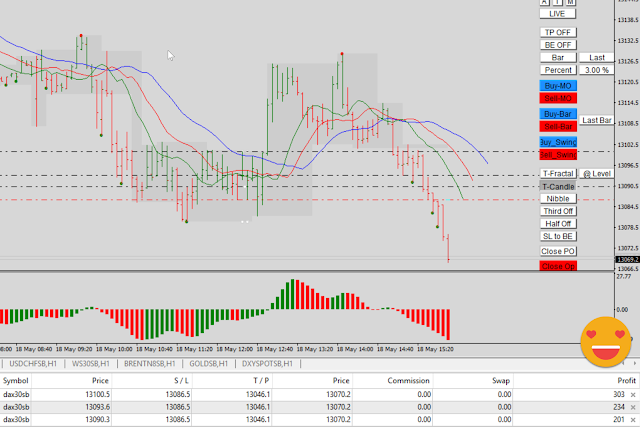 Since positions were fully loaded it was good time to bank some profits. 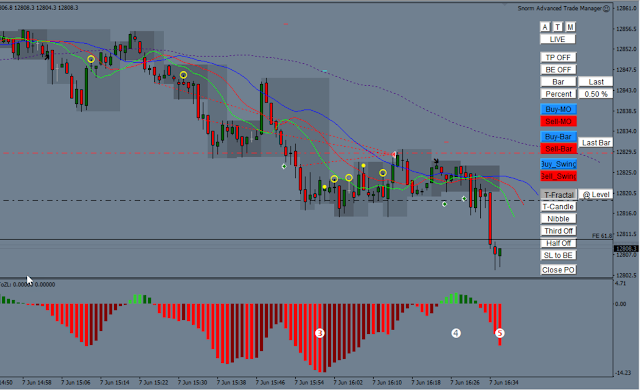 Closed two positions and let the initial running. Soon the trail bar was hit and I decided to exit all positions. I had been waiting for this to play out all morning so I was a bit tired. Turns out it was a good decision anyway. It was a good trade. The following image shows that our exit was spot on and later it provided another opportunity to catch the 5 down of the C down. Good 2nd Attempt for W5 Hits TZ1. Next if you were keen on this, and looked at m1, you'd have caught the peak of abc that is W4 up. Finally a little tip for how AIMS The Purple Line could help with Fractal Geometric Trading Opportunities. How to Spot Apple of M1 using Purple on M5.